My name is Olivia Browne and I am currently a sophomore. I started out as a Kinesiology major, in the college of Health and Human Development, last year as a freshman and struggled all year. I decided then that science just wasn’t for me. I really wanted to pursue sports medicine or physical therapy. I then planned to go into the college of communications and utilize my creativity as a Advertising major! Although I loved the idea of doing something in the health industry I still plan on incorporating something along the lines of personal training or fitness instruction as a side job or hobby. If you click here you will find and article relating to the “right and left brain”…. this interests me because some say that creativity is linked with which hand you use to write with. I really wondered if one has anything to do with the other. I also wondered if you could be more “right brained” or more “left brained”. This is something I find very interesting. I chose this class because I heard from my freshman roommate that it was a fun interactive class that involved writing (which I love) and science that is somewhat abstract (which I also love). Overall I look forward to getting to know some of you, and good luck this semester! This entry was posted in Uncategorized on August 29, 2016 by Olivia Anne Browne. Hi Olivia! 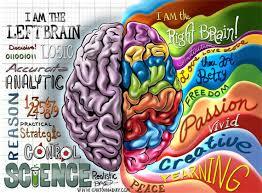 Learning about the left and right hemispheres of the brain has always been a topic that interests me. I think it is incredible that your dominant hand, brain lateralization (being dominant in one side of the brain more than the other), and more have an influence in who you are and how you think. Because the right and left idea is something you have liked to learn about, I thought you’d maybe find interest in how the right and left sides of the body differ, too! If you click this link and scroll the bottom it talks about how one side of your body is symbolic of having male aspects, while the other is female. Whether or not it is true, I think it’s pretty cool to consider! Hey Olivia! I loved your image of the 2 halves of the brain that you posted. I completely agree- I believe I am right brained almost 90%. I love creatively thinking and stepping outside of the box. I like to break the rules and reach outside of my comfort zone with things that challenge me. There was a time when I debated majoring in genetics, which would have been a science track. However, I found my passion in writing and reporting. But I still really find biology and the way people are so different very interesting.